Judges occupy a paradoxical position in American culture. They are figures of reverence, respect and wisdom. They are the ultimate authority on matters of law and justice. At the same time, there are also celebrity judges who star in their own courtroom reality television shows. Because of this, a judge costume can be both serious and funny, making it resonate as a dress-up idea for Halloween or for a costume party. Judge costumes are also easy to pull off, whether for kids or for adults. If you do it right, your costume could set the "bench" mark for costume quality. Any judge costume has to begin with the traditional black robe. A judge's robe should be dark black, long and loose. See if you can get a black choir robe from a thrift shop. If you can't find one, a black bathrobe can work, as long as it has baggy, loose sleeves. Wear black pants and black shoes to go along with it. A white shirt with a collar should go under the robe. Boys and men can wear a tie as well. Although you don't see it so much anymore, it is traditional for judges to wear a white wig. Look for a white judge's wig at a costume shop or thrift store. You can also make one out of white toilet paper rolls, or brown ones painted white. Punch two holes in each side of the rolls and string them together with twine. Affix the rolls to a knit cap and glue cotton balls into the ends of the rolls. A gavel is the judge's most important prop. You can use it to bang on objects and pronounce judgement at whatever costume function you are attending. You might be able to find a gavel in a flea market or awards store. Like the wig, you can also make one with a toilet paper roll. Cut a small hole in the roll and attach chopstick. The gavel might look light, but you can still yield it with authority. There are other flourishes you can add to make your judge's costume as authentic as possible. For both kids and adults, the face is important. Wear glasses, whether prescription or empty frames, to convey a look of authority and wisdom. For girls, makeup such as lipstick can add formality. In addition, demeanor is important to the overall costume. Walk around with a serious look on your face. 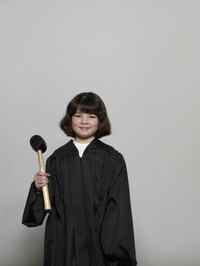 Bang your gavel whenever you see someone doing something you deem incorrect. Yell out "overruled" to people at your costume function.